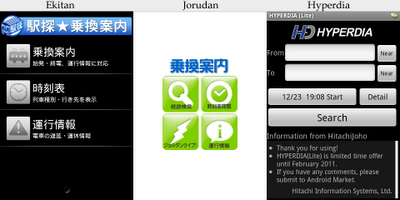 Until now, the best free android app for train search in Japan was 乗換案内 by Jorudan. There are other apps, but these are just front ends for a browser search of google or goo transit. 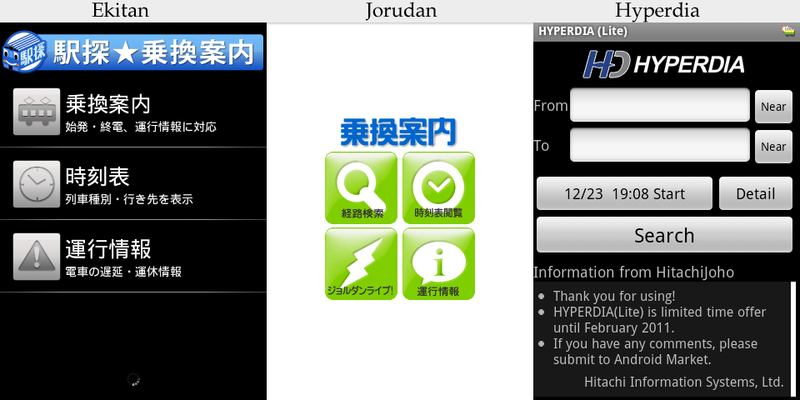 Recently, two new apps were released by ekitan and hyperdia. The hyperdia app, also named 乗換案内 is promising because it is the only one with an English localization, albeit a bit engrishy (for now). Of course there is also navitime, which is a subscription service that adds navigation and maps, but as the google maps app continues to improve, there is little reason to pay for navitime. At present, about the only things navitime does that google doesn't is tell you which carriage to ride in for the easiest transfer and provide exit numbers with walking directions. I excluded the google maps app from this comparison because it is a bit too omoi (heavy) to fire up for a quick train schedule search. I mainly use Jorudan, but am giving ekitan a try and am likely to switch to it because it meets my needs. Hyperdia is not quite there yet, but I expect it will improve quickly. Tested handset: ht-03a (Android 2.2.1); Compatible handsets according to dev: Xperia (Android 1.6); Version: 1.0.3(4). The thing I like most about hyperdia is the configurable defaults, from the number of transfer stations to use (up to 10! ), to the ability to automatically search 5 to 10 minutes in advance without having to manually specify departure time for each search. Hyperdia allows searching by arrival time to be set to default. The GPS function works extremely quickly in my opinion. Of course, many readers are sure to appreciate the English localization and the ability to search in romaji. It is still in beta and will cease to function in February, though the dev includes the possibility of an extension. Presumably the reason for expiration is that they don't want an old buggy beta floating around, though they could still be considering monetization options. And it is buggy. It appears to be using an embedded browser to display results pulled from their servers. Leaving the app and returning often (but not always) causes the browser to reload, but the URL is malformed and the search fails. It also FCs sometimes. The app purportedly includes timetable search functionality, but I can't find this option anywhere, so I assume this feature is not implemented. There is also a bit of quirkiness. The dev uses half the screen real estate to remind us the app will expire. To pull up search history, you have to click in the text box, which unfortunately brings up the keyboard, partially obscuring said history; a much better way would be dedicated buttons for history, like the other apps use. Where these buttons should be located, there are buttons for locating nearby stations by GPS. In my opinion, there is no need for a function to pull up arrival station by GPS, since if the station is that close, I'm walking. These two buttons could be consolidated into one and moved elsewhere allowing room for history buttons. Tested handset: ht-03a (Android 2.2.1). Compatible handsets according to dev: Desire, Desire HD, Galaxy S, Galaxy Tab, IS03, Lynx 3D sh-03c, Regza T-01C, Xperia; Version: 1.1.0(20101221). This app should have the folks at jorudan worried. It is surprisingly refined for something that just hit the market. It includes an extremely responsive auto suggestion feature that quickly predicts station names as you type. The transit result screen is excellent, including a refresh button and displaying quick links to each route, as well as a route overview that includes lines, times, prices, number of transfers, and the standard 安 早 楽 labels. After clicking through to a route, there is an option to mail or tweet the schedule, though there is only support for gmail and twitter. Overall, I am very impressed. The Ekitan app handles search history different than jorudan. First, there is no integrated search history, meaning that if you search for a timetable for a particular station, that station will not appear in the history for transit searches or vice versa. (I seem to recall finding a way to bring up a timetable for a station that is in the transit search history, but the method is obscure, so obscure that I can't for the life of me remember how I did it.) Second, Ekitan saves actual station timetables for a preset line and direction. Depending on your train usage habits, this could be a convenient feature if you always take the same line in the same direction or could result in multiple entries for the same station. For example, the far right of the image below shows three saved timetables for Tokyo Station. Timetable history is limited to only 10 entries. One of the downsides of this app is that querying for search results is on average slow, more than twice as long as the other apps it seems. The first time searching a timetable can be much, much slower. I suspect this is unrelated to the fact that my handset is technically unsupported. At the bottom of the screen, there is always a looping "working" indicator. I assume it is trying to load up an ad that is being blocked by AdFree. Settings are sparse, containing only an option for ordering results (speed, price, transfers), walking speed, and whether to use extra cost-incurring express trains for trips under 100 km. It also uses twice the RAM of the other apps, more than what google maps uses. I personnally use "Japan Trains"
"Japan Trains" app also allows "copy/paste" of the search results, so you can save them as notes, emails, etc. Hyperdia works perfectly well and post beta too and is fully in English, Jorudan is only in Japanese and keeps telling me my station doesn't exist. Jorudan = fail. For full station timetables, I downloaded them as pdfs (kintetsu anyway) and use a pdf reader for that. I reckon this is due for an update! I'm sick of "Japan Trains" not showing transfer info properly (when you don't need to change train) and Jorudan is full of spam and regularly misses services. Ekitan seems to be really good actually (but somewhat limited utility to me in Japanese), and the English version of hyperdia seems pretty good too.